(Spitfire and the Troubleshooters#1 (fb) - BTS) - Jenny Swensen became a professor at M.I.T., where she established a reputation for high tech pranks, like the "disappearing cafeteria." She eventually became close with a quintet of student prodigies and pranksters nicknamed the Troubleshooters. (Spitfire and the Troubleshooters#1) <August 5-9 1986> - The Troubleshooters ran into Swensen while they were in the process of reassembling a tractor in Chairman Dibble's office. They subsequently assisted Swensen in stealing the MAX armor, model 2, developed by her father and usurped by Fritz Krotze, and her father's laboratory itself (contained within three tractor-trailer trucks) from Krotze. (Spitfire and the Troubleshooters#2) <August 23, 1986> - Jenny and the Troubleshooters tested the armor in Parker's Hill, New Hampshire, during which time she saved a trio of hunter's who had nearly driven off a cliff. The men's reports alerted Krotze to her location, and he sent the Behemoth, an experimental Department of Defense tank, after her. Using the MAX technology, Eduardo developed a pair servo-motor "Strong-Arms," which he used in an attempt to investigate the tank, but he was captured by Krotze's men. Spitfire managed to destroy the tank and free Eduardo. 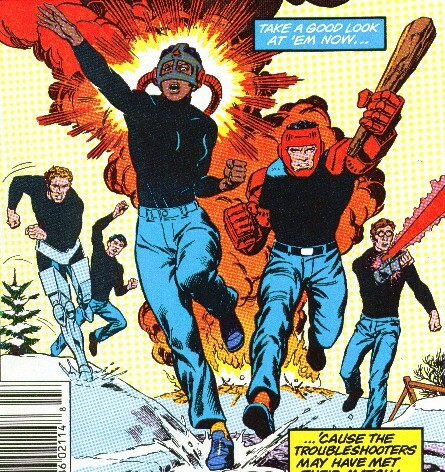 (Spitfire and the Troubleshooters#3) <September 12, 1986> - Tim Ferris designed the MAX-derived speed-enhancing leg braces "Fastball." Using her own MAX-derived cybernetic hook-up "Think Tank," Terry located evidence of illegal arm sales in Krotze's computers. Jenny wore the armor and broke back into Krotze International, where she was nearly killed by a laser trap set by Krotze. Saved by the Troubleshooters (specifically Fastball), Swensen disabled the laser and escaped with the laser disk containing the information she had sought. (Spitfire and the Troubleshooters#4) <October 10-12, 1986> - The Troubleshooters watched news coverage of Jenny appearing before Congress in the armor, handing over the disk on Krotze as evidence of his activities. They debated what her going public would mean for them. They later attended a party in Jenny's honor at MIT, where she was assaulted by Steel Hawk and then arrested for the murder of Krotze, for which she had been framed by Steel Hawk. (Spitfire and the Troubleshooters#5) <November 13, 1986> - The Troubleshooters stole back the MAX armor from the evidence and property warehouse of the Boston Police Department. Giotti piloted the malfunctioning armor, whose power pack was overheating, and Jenny sent Star Brand possessor Ken Connell to save him. Connell hurled the power pack high into the air before it could explode. Terry was questioned by Detectives Sloan and Jenkins, and commented that she was uncertain of Swensen's innocence. (Spitfire and the Troubleshooters#6) <December 19, 1986> - After charges on Swensen were dropped, Terry used her Think-Tank to locate the farm where Steel Hawk was working out of, but Jenny insisted they not investigate -- which they did anyway. Meadows field-tested his energy blasting wrist units, Beam-Splitter. Narrowly surviving Steel Hawk's boobytraps, they learned that he intended to assassinate the British Prime Minister, and they decided to stop him. (Spitfire and the Troubleshooters#7 (fb)) <December 19, 1986> - Operating at super-speed, Ferris used the Fastball braces to grab Steel Hawk's bomb and hurl it into the air before it could explode. (Spitfire and the Troubleshooters#7) <January 15, 1987> - The Troubleshooters all planned to retire from field activity. However, Steel Hawk had identified them and ambushed Ferris, managing to tag him with a missile launcher despite his attempts to flee using Fastball, and he had to have both legs amputated. Steel Hawk then ambushed Giotti, Meadows, and Roberts. Steel Hawk evaded Roberts Beam-Splitter blasts and appeared to be trapped under a tree by Giotti, but then tackled Meadows from behind and killed him with his own weapon. Steel Hawk then escaped. (Spitfire#8) <February 4, 1987> - After attending Meadows' funeral, Eduardo plotted revenge against Steel Hawk. Chin refused to get involved and risk further death, but Terry used her Think Tank to invade the FBI's database and gain info on Steel Hawk. Wearing his Strong-Arms, Eduardo surprised Steel Hawk in mid-massage, beating him mercilessly. Steel Hawk survived when his lover, Varna, fought off Eduardo and carried him off. (Spitfire#9) <February 5, 1987> - Eduardo destroyed his Strongarms and retired from action. COMMENTS: Created by Eliot Brown, John Morelli, Gerry Conway, Herb Trimpe, and Joe Sinnott & Morgan. I seriously doubt we'll ever seen any of these characters again, but I'd guess that Varna would have tracked down and murdered the surviving Troubleshooters. She might have even gone after Spitfire (later Chrome), too, but it's all speculation. Spitfire and the Troubleshooters didn't really fit the design of the New Universe, in that it utilized advanced technology not present in contemporary reality. The most reasonable of the group, he was the only one not to design anything with from the MAX technology. When Eduardo plotted vengeance on Steel Hawk, Eric parted ways with him. He designed the Fastball armor, which allowed him to move his legs at great speeds, primarily for running or bicycling, achieving great speeds. The braces allowed him to save the Prime Minister from Steel Hawk's bomb, but they were not fast enough to evade a missile launcher, and his legs were amputated above the knees after being nailed by Steel Hawk. Brash and headstrong, he had a crush on Jenny Swensen. He rushed in to investigate Krotze, but found that the arms didn't stop him from being struck from behind, and he had to be rescued by Spitfire. He piloted the damaged Spitfire armor and was saved by Ken Connell from its overloaded power pack, which exploded. He sought out and attacked Steel Hawk, but was driven off by Varna before he could finish him off. After Jenny mysteriously vanished, he destroyed his Strongarms and retired from activity. He designed the Strongarms, a pair of braces that could enhance his striking force and crushing ability. He designed the Beam-Splitter, which fired energy blasts from its wrist units. However, he got too close to Steel Hawk, who grabbed him and fired his own weapon through his chest, killing him instantly. She had a crush on Eduardo, and resented Jenny Swensen due to Eduardo's attraction towards her. However, when the chips were down, she always helped out, though it was often related to her desire to keep Eduardo happy. She designed Think Tank, which allowed her to link up to computer networks and scan information at rapid speeds. The information rush could be quite disorienting. She had no offensive abilities.